What’s a king to do when his kingdom is in turmoil and his people have started to turn against him? He must revert back to what he knows best – battle. Most kings gained their respect and stature on the battlefield, and this northern king is no exception – he’s ready to show the people he will fight alongside them. You don't have to play games of royal intrigue to wear this Northern King Costume. But if you choose to, you'll look the part. 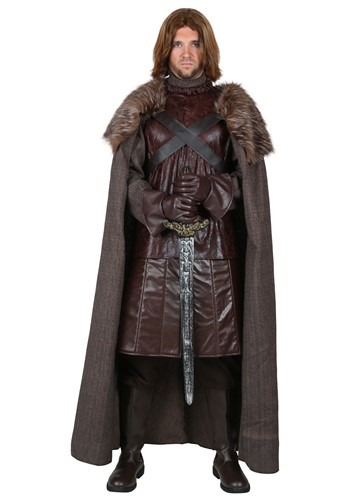 Get ready to make a night patrol and guard against invaders from beyond the wall this Halloween. This northern king costume comes with everything you need to ensure that everyone you cross knows you are royalty and knows that they should bow down to you at a moment’s notice. The adult costume comes with a tunic that is faux suede and leather and has a back zipper for easy on and off. The tunic’s faux linen collar and sleeves give it a realistic look. No king is king without a cape, and this cape does not disappoint. The full-length linen cape has a luxurious faux fur collar and fastens with faux leather straps and a metal buckle. Be sure your grip on your sword stays tight with the faux leather gloves with flared, wide cuffs that will make an impression on your enemies. Add a pair of brown boots, cropped pants, and a toy sword accessory for a complete look that will earn you respect from all of the soldiers and peasants under your control.